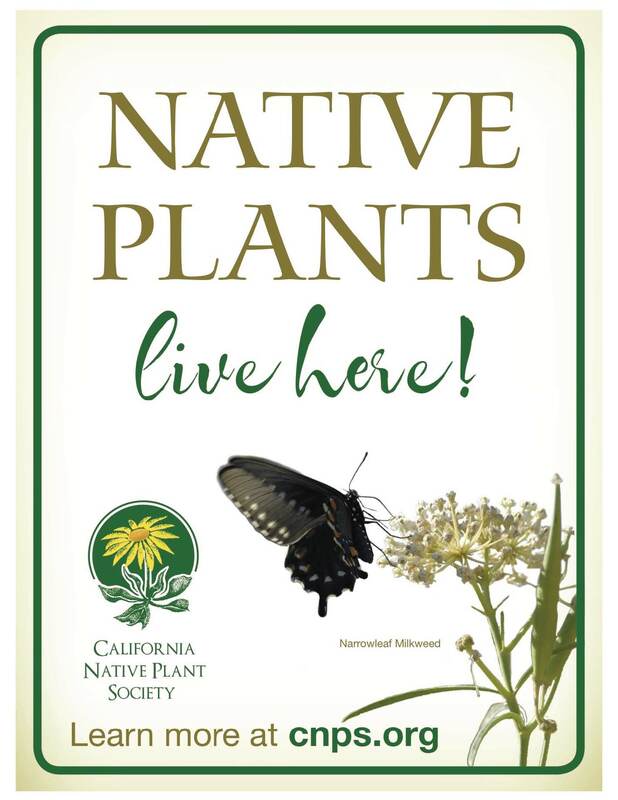 CNPS soon will be offering Garden Signs that anyone with native plants in their garden can buy and display. We announced the signs to generate neighborhood interest in the gardens that are bringing us all into the future: great landscapes with habitat, low water use, reliance on Integrated Pest Management instead of chemicals, and help us to conserve native plants throughout the state and Baja. The signs are meant as a marker of recognition. People who buy the signs are not being “certified”, nor are the gardens inspected. This less formal approach to garden signage means more people will feel able to participate and welcomed into the community. These signs are the best quality marker because they go way beyond drought-tolerant or “California Friendly”. These ARE California. This is a proud moment, so join your friends and neighbors and get a sign. Check the CNPS web store in mid-October to purchase! With the announcement of the Garden Sign program, we have provided resources to CNPS chapters – a toolkit of information that helps the chapters to announce this in their chapters and the local marketplace. The information has been prepared by a group of experts in horticulture, soil biology, plant communities, biology, wildlife, and conservation. These resources will be added to the CNPS website under the title “Garden Signs Toolkit” in mid-October. This entry was posted in Garden Design, Miscellaneous. Bookmark the permalink.